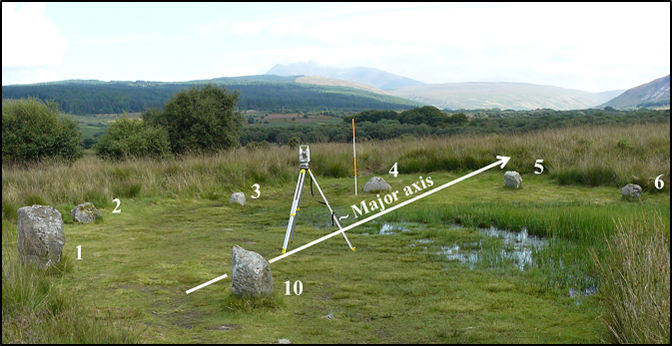 Six stone circles are visible on the moor immediately east of the derelict Moss Farm. 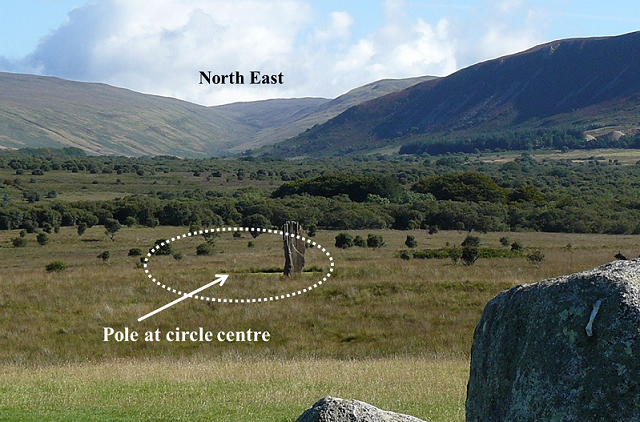 Some circles are formed of granite boulders, while others are built of tall red sandstone pillars The moor is covered with other prehistoric remains, including standing stones, burial cairns an d cists. 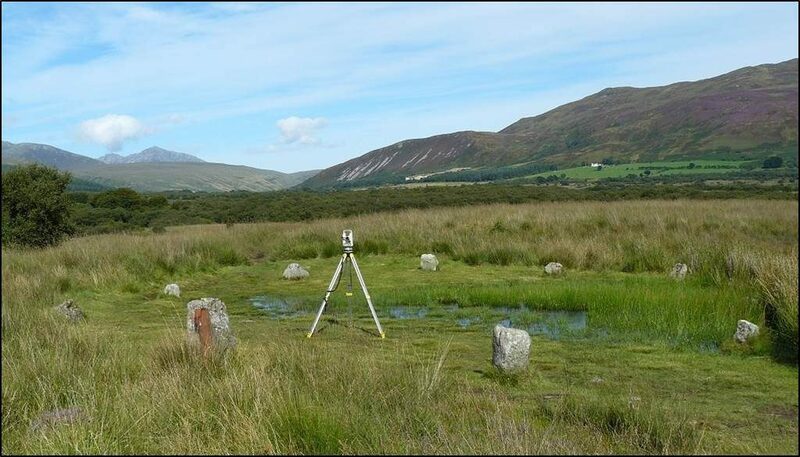 The stone circles are positioned over previous timber circles A radiocarbon date of 2030 ± 180 BCE has been found for the timber circle at Machrie Moor 1 Several hut circles can also be seen as low rings of turf-covered stone. 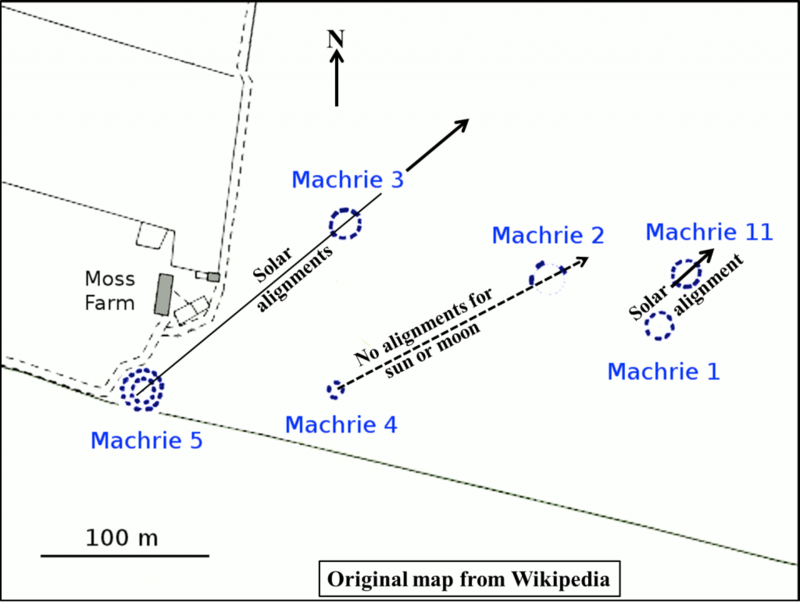 The six stone circles are situated below a prominent notch on the skyline to the northeast where Machrie Glen divides into two steep-sided valleys At the summer solstice the notch is intersected by the sun at sunrise, and this may explain why the circles were sited in this location. (See Wikipedia for references plus further descriptions). 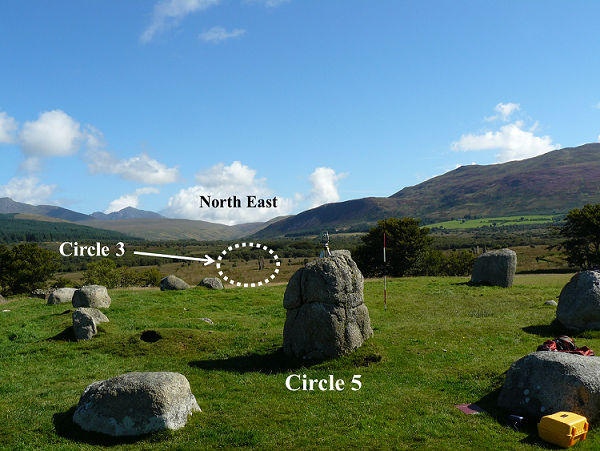 The stone circles are believed to date from the Early Bronze Age, 1800-1600 BCE. 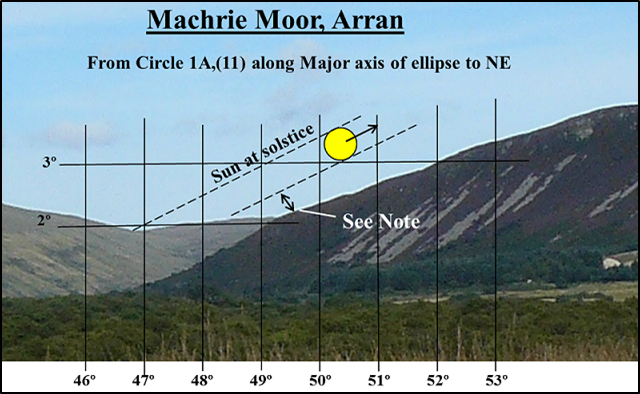 Although the general claim that the circles may indicate Machrie Glen to the north east this does not seem to be based on measurements. The view from the centre of circle 5 over the centre of circle 3 leads directly to Machrie Glen in the north east. 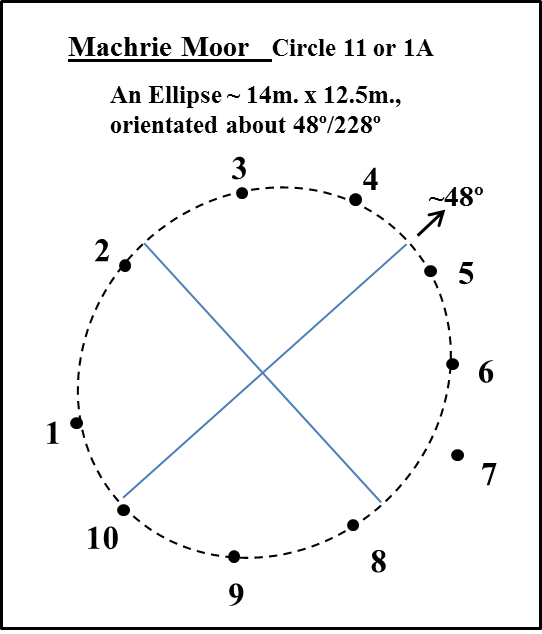 The lower limb of the moon at the solstice passes the rather indistinct hill intersection by about 4ʹ of arc. At 4 or 5 days from the solstice the lower limb would be at the intersection. However given the imprecise nature of the potential foresight and the fact that the daily change in declination at that time is less than 2ʹ of arc then, despite what was said in the introduction to this section, there could be a case for the upper limb of the sun being used. The upper limb would be at the intersection 13 days before/after the solstice. At that time the daily change in declination would be 6ʹ or arc, an amount easily seen against the minor hill intersection. The foresight at about 9 km. is far enough away to be relatively insensitive to a change in observing position. A lateral movement of 5 m. would result in a change of less than 1ʹ of arc in declination or about 2ʹ of arc in azimuth. The short straight slope marked looked likely for alignment use, but it was not used. None of the paths for significant declinations of sun or moon coincide with usable features. The lower limb of the rising sun at the solstice is about 20ʹof arc clear of the ridge. The lower limb would be at the ridge 10 days before/after the solstice.